Welcome to the Ultimate List of Dog Trick Ideas! On this page you will find a list of 100 dog tricks you can teach your dog. They are here to inspire you, motivate you and get you to spend time with your dog training and ultimately creating a closer bond with your dog. Enjoy! 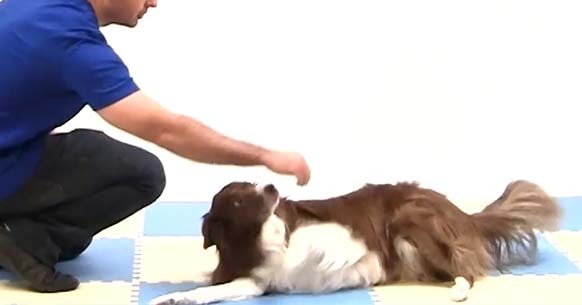 The idea of this trick is to encourage calm self-control in your dog. By learning that he only gets a reward when he is calm and waits for permission then your dog will be focused to learn. Visually pleasing to both the trainer and onlookers the wait command makes your dog appear completely obedient and tuned into the wishes of his trainer, this action is useful as a prelude to something more complicated. For a simple trick to teach, the wait command is neat and effective and extremely useful. Dog trainers love this trick because it teaches a dog to focus and be controlled during training sessions and everyday life. Does your dog ignore you when you call him? And does he respond only after you’ve called him maybe three or four times? You’re not alone—I understand what you’re going through. You see, my dog, Onyx (a purebred Siberian husky), wasn’t always the perfectly behaved dog she is now. There was a time when she would completely ignore me when she was in the backyard sniffing the grass. I would have to call her four or five times before she even looked at me. And it was so frustrating because I knew she could hear me, yet she was choosing to ignore me and continue sniffing the grass. So, in this short article, I’m going to share three of the most important lessons I learned while training Onyx to come to me on command. Lesson #1 – Understanding your dog’s point of view. 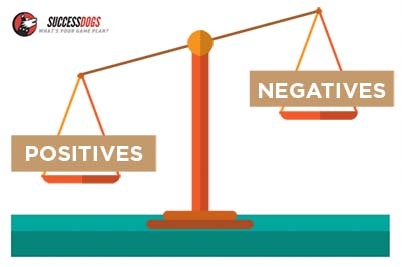 Every time you call him, your dog will evaluate the positives and negatives of this choice. For example, if your dog believes that you’re going to give him a delicious steak if he comes to you, this belief most likely will dwarf any other choices in his mind. 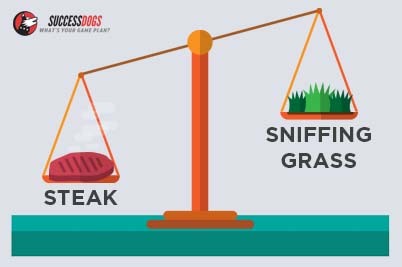 Your dog will evaluate the options: sniffing the grass or eating a steak. Simple choice, right? Yet many dog owners don’t realize that this process of choice also operates in reverse. For example, if your dog believes you’re going to punish him and yell at him if he comes to you, it will be an easy choice to keep sniffing the grass. So whenever you want your dog to come to you, think about what’s in it for your dog. I’m not saying you should bribe your dog to come to you, but you do have to be aware of what you’re offering your dog. Praise and play go a long way. Imagine if you gave your dog total undivided attention for sixty seconds every time he came to you by playing tug-of-war or having a wrestling session. That would totally change his perceived value of coming to you. You also have to be aware of what your dog is doing and how much of a reward it is when you call him to come to you. Remember—not every reward has equal value in your dog’s mind. For example, let’s say your dog is running after a squirrel in the backyard. The reward level for this activity would be through the roof; even a steak might not be enticing enough to get him to stop chasing the squirrel. So, with Onyx, who loves to sniff the grass in my backyard, I know that she gets the most value from this behavior in the first five to ten minutes. After this amount of time, it becomes a little boring for her, and this presents me with the best opportunity to call her to me. 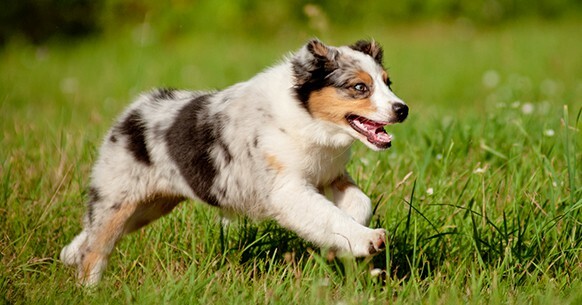 Training your dog to come on command is a game of balancing what you offer (giving your dog a reward after coming to you) and requesting the behavior at the appropriate time (when the self-rewarding behavior is at its lowest value, or when you believe your dog will choose you instead of his current activity). Whenever either one of those actions is out of whack, your dog isn’t going to choose you. Lesson #2 – Coming to you is a loss of freedom. You also want to be aware of what happens after you call your dog to you. Dogs are a lot smarter than we give them credit for, and they will make the connection about what happens after they come to you. For example, you’re at the dog park and your dog is having an exciting time with other dogs. You realize it’s time to go, and you call your dog to you. Over time, your dog is going to make the connection that coming to you is not a great choice because all the fun stops, the leash is put on him, and he has to go back home. So you have to become unpredictable. You have to sometimes call your dog over only to give him a reward and let him go back to whatever he is doing. This is why I’m such a big fan of playing training games with dogs, as they teach dogs to come on command and there are no drawbacks. The dog doesn’t think he will lose his freedom; he comes to you because it’s pleasurable. This is a lesson I describe in my Fido, Come training program (which you can learn more about here). Did you know that you can train your dog to come using any word or command? You could literally train your dog to come to the word “banana” or “spider.” The word itself is meaningless. Your dog learns to come to you after hearing a particular word only because he’s been conditioned to do so. 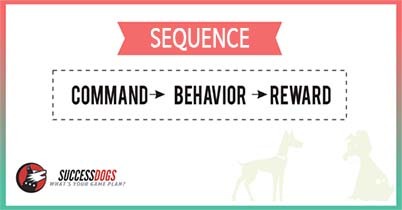 Maybe you’ve done this consciously or unconsciously, but there must always be a particular sequence of events for your dog to respond to a command. But the key for this command to work is that you must have proper timing. This means that every event in the sequence must occur in close proximity to the next event. For example, if you give your dog a treat five minutes after coming to you, he’s not going to make the connection that the treat is a reward for coming to you. The same is true if you call your dog to come to you and he comes to you five minutes later. Even if you give him a delicious steak, he’s not going to learn the command, because the time duration between events is too long. Ideally, you want your dog to respond within five seconds of your calling him and you want to give him the reward immediately after he gets to you. The quicker everything happens, the better. Your dog isn’t really going to know what your command means at first. This is why I always tell my students to play my “Boomerang” training game, which is a super-simple way of teaching dogs to come after hearing a command. This training game should be the foundation for every other training game you play with your dog. 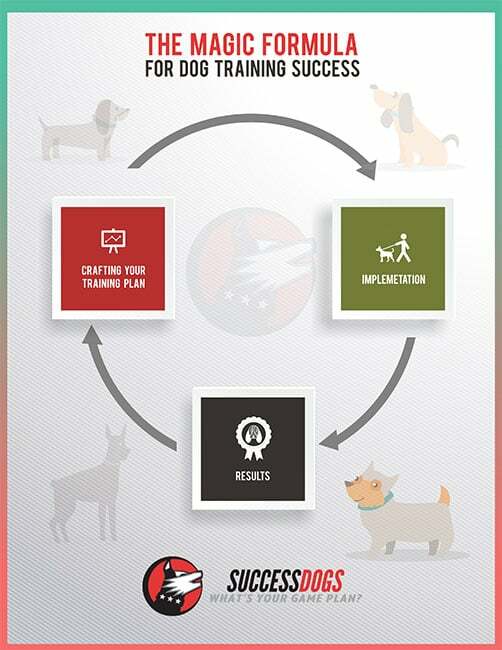 In this post, I’m going to walk you through exactly what we do here at Success Dogs to create a dog training game plan to solve any dog training problem. This is the same process that I use to create our online dog training programs or when I work with a dog one-on-one. 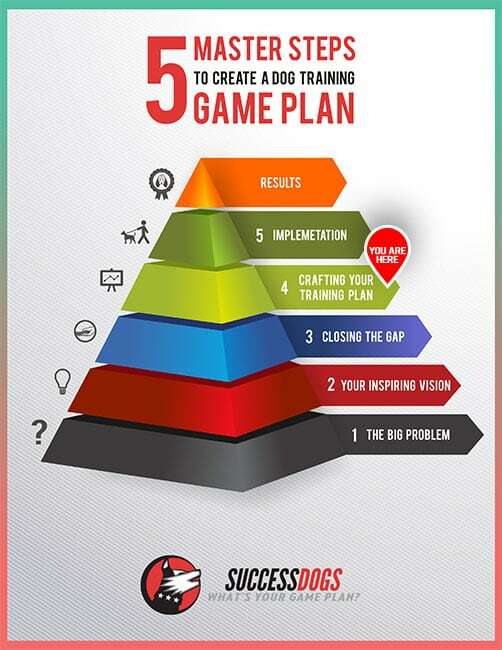 Before we dive in, you might be wondering what a game plan is. 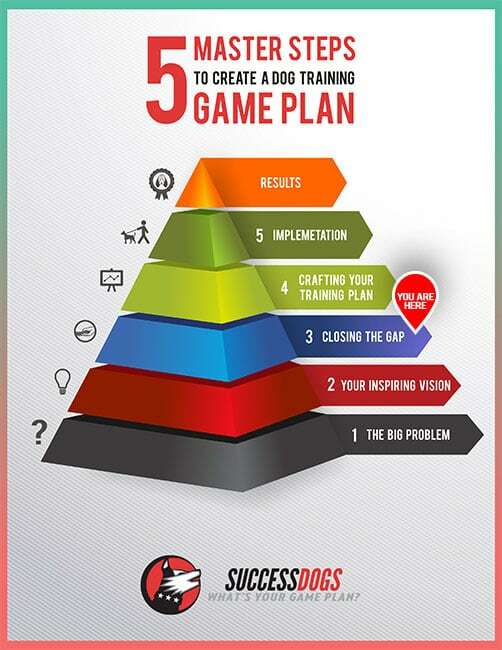 A game plan is our term for an outlined strategy to solve a particular problem or to teach a dog a particular skill. Think of a sport: Coaches have to come up with a winning strategy before they step a foot onto the field. They have to create a plan that they believe will bring them to victory. 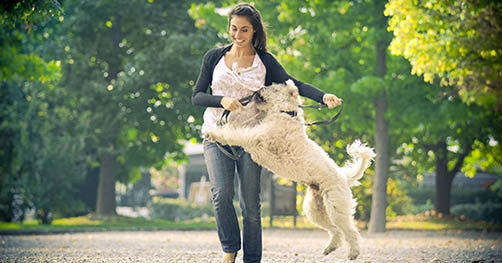 We approach dog training the same way—with an end result in mind. 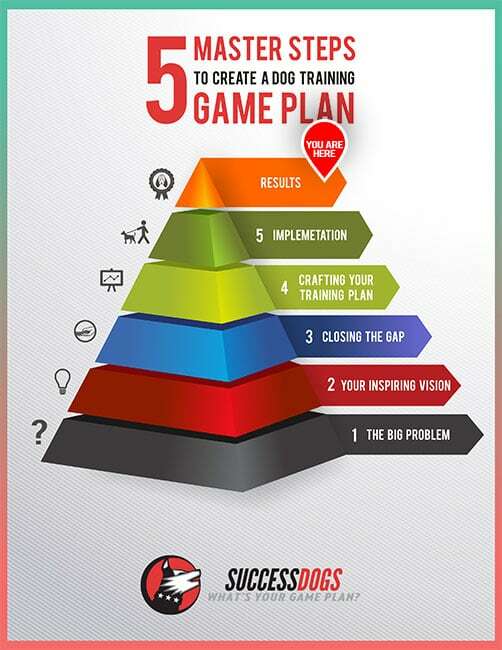 Then we create a training plan that adheres to our guiding principles. The first thing that you need to do is identify what the big problem is. And by big problem, I mean whatever you want to solve with your dog. Maybe it’s peeing on the carpet, not coming when called, or pulling on the leash. Whatever it is, you have to be clear about solving one specific problem. Oftentimes when a dog owner asks me to help train their dog, the owner will tell me how their dog has many problems and will want me to create a training plan to solve all of them. And I have to tell the owner that it’s better to focus on solving one problem at a time than to try tackling four or five problems and end up becoming overwhelmed and frustrated. So right now, think about one specific problem with your dog, and dedicate the remainder of this guide to solving it. 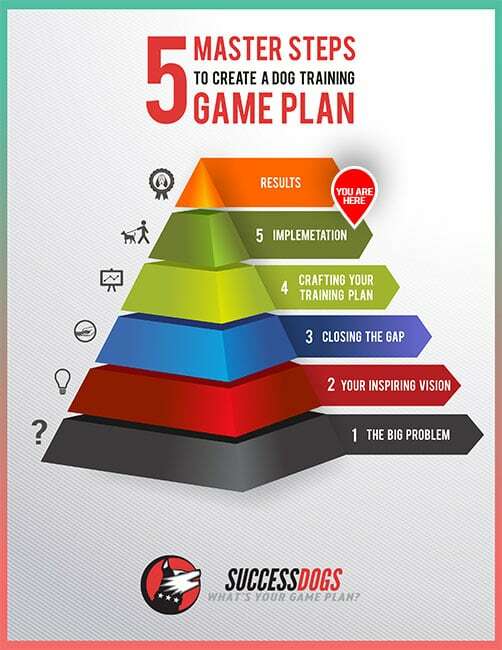 To help you understand how I go about creating a training game plan, I will go through the process as if I’m working with a dog that pulls on the leash. I recently worked with a dog that had this problem, so it’s fresh in my mind. YOUR ASSIGNMENT: Write down one problem with your dog that you are dedicated to solving. Once you know exactly which problem you want to change, it’s time to move on to the next step, which is to create an inspiring vision. This is what you want your dog to become, or how you would like it to be if your dog didn’t have the particular problem. Really think about this. The clearer you are about what it is that you want, the more likely you will be to attain it. It’s not enough to go from “my dog is digging in the backyard” to “I want my dog to not dig in the backyard.” That isn’t going to motivate anybody, and to be totally honest with you, you’re going to need to take some action to solve your dog’s problem. There’s just no way around that. You need to create an inspiring vision so you are pulled forward toward change rather than having to force yourself to take action. I’ve been to dozens of self-help seminars, including all of Tony Robbins’ seminars, and what they all have in common is that you have to create in your mind a clear picture of what you want—something that emotionally inspires you. So think about your vision and add emotion to it. How would you feel if your dog never had this problem again? How much stress would that eliminate? How much happier would you be? And how would your relationship with your dog grow as a result? Would you feel closer to your dog? Would you enjoy your dog’s company more? Step into this vision and feel like it’s happening today. How do you feel? ASSIGNMENT: Write down in your own words a vision of your dog that inspires you. When you think about the problem you have with your dog and your inspiring vision, there’s an obvious gap between the two. This stage is about figuring out ways to close this gap. First, let’s analyze the problem in a little bit more depth. 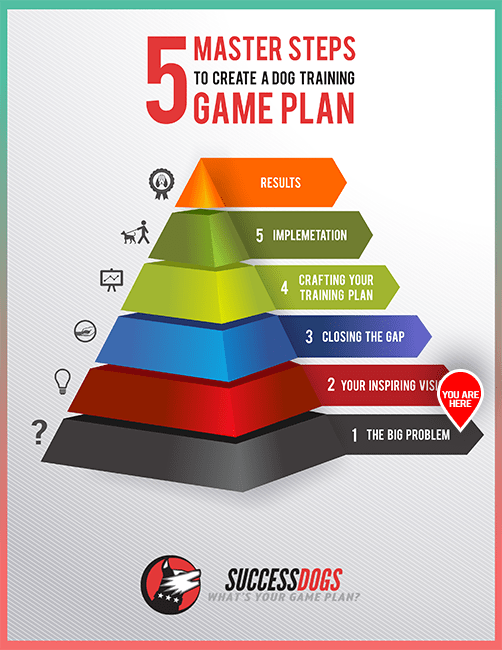 The more you know about it, the easier it’s going to be to craft your training game plan. #1: When does this problem occur? #2: What triggers the problem to occur? #3: Is there more than one trigger? Your answers to these questions will give you a great deal of clarity. For example, when I answered them for a dog that was pulling on the leash, I figured out that she would pull mainly when she wanted to get to something, whether that was a leaf blowing, grass on the ground, or an exciting smell coming from an object. She didn’t really “pull all the time,” as her owner described the behavior to me. From those answers, you should be able to come up with a list of one or two focus areas that you need to work on with your dog. For example, if the dog lunges at a blowing leaf, I need to develop the dog’s self-control skills—that’s one focus area. And if the dog strains at the end of the leash, I need to build that dog’s attention skills—that’s a second focus area. 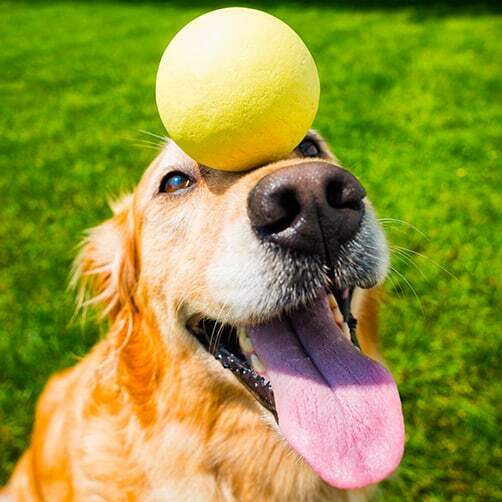 You always want to think in terms of improving your dog’s particular skill or ability. This will keep you from falling into the punishment trap, in which you punish your dog for not doing what you want. ASSIGNMENT: Write down one or two focus areas that you’ll commit to improving. Do you see the magic in what we’ve done so far? Instead of having one giant and overwhelming problem that you’re trying to solve, you can instead focus solely on one or two areas. This completely changes the way that you’re going to go about training. 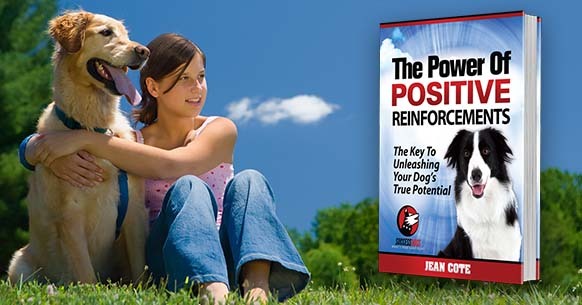 In this stage, the objective is to create action steps that you can implement with your dog on a daily basis. You’ll need to take each of your focus areas and brainstorm ways to improve them, while making sure that they are both achievable and incremental. What I mean is that you must always set your dog up for success, and each step should build upon the previous one so that the focus area gradually improves. As you can see, some of these action items from both focus areas overlap. And that’s okay, but can you see how the focus is on developing the skill rather than on stopping the problem? ASSIGNMENT: Write at least ten action items for each focus area. Don’t try to make this perfect—just brainstorm, and you can always revise the list later. 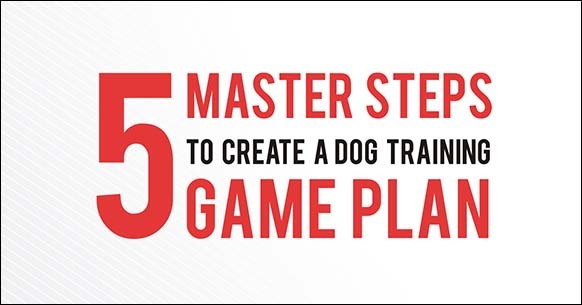 Once you’ve created your training plan, the only thing left to do is to implement it with your dog. From my experience in training dogs, there’s nothing like the power of scheduling. I know that this isn’t attractive, but if you write down on your calendar which days you’re committed to training your dog and for how long, you’ll be much more likely to follow through. I know that you’re busy. You work long hours, and you really don’t feel like training your dog after a long and busy day at work. I get it. But what if you only committed to implementing this training plan for a week, two weeks, or a month? That’s a very small fraction of your dog’s life and could make a huge difference. Do you remember your inspiring vision? This is what’s going to motivate you to take action and take the time to train your dog. How often and how long you should train your dog is totally dependent on what the problem is and how much time you have. I highly recommend keeping your training sessions short (about fifteen to twenty minutes)—shorter if you are working on an intricate behavior. The minimum that you should train your dog is once a day. You won’t get the results that you want if you skip days or train your dog only once a week. And if you want even faster results, you can train several times per day, say in the morning, afternoon, and evening. ASSIGNMENT: Schedule your next three training sessions with your dog. They can happen all during one day or be spread out over three days. Once you implement the training plan with your dog, you will notice results. And if these results are not exactly what you’re looking for, that’s okay. You may have to change something in your training plan. This is exactly what I do with every dog that I work with. 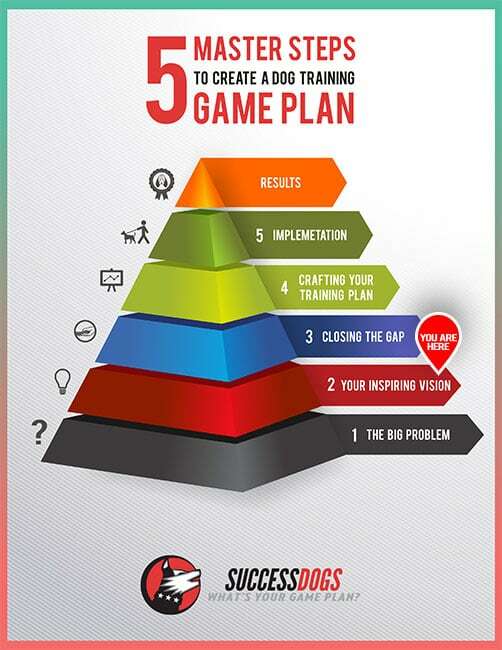 First, I implement the training plan that I created. If the action item inside the training plan doesn’t work, I simply go back to the drawing board and make a change. I then try again, and do this over and over until I succeed. 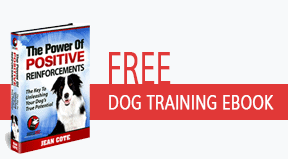 This is the magic formula for dog training success. This is the exact process that I use to train any dog, regardless of the problem. And now, you can use it with your own dog. If you would like to see exactly how I worked with the dog that pulled on the leash, I recorded all of my training sessions and created a course called The Walk in Harmony Game Plan. Inside, you can see exactly which skills I developed and how, as well as all of the different action items that I implemented to get what her owner wanted, a dog that walked nicely on a loose leash. Not too long ago I was looking at videos of show dogs. You know—those dogs that can do amazing things on talent shows. One trick in particular struck me as simply amazing. I saw a dog stand and walk on his hind legs, and I thought it was the coolest thing ever. So I decided to teach it to my dog. And it worked! Here’s a video of how I did it, and it’s only four minutes long. I have added some additional training information and tips below. Be sure to read them when you teach your dog this trick. Before you begin training your dog, it is important to note that standing tall on its hind legs is not a natural behavior for your dog. This is not going to be comfortable, especially if you have a larger dog. Smaller dogs usually have a much easier time with this trick. I must also caution you that if you have any concern about your dog’s hips or hind legs, or if your dog has a history of injury in that area, then you should not attempt to train for this trick. Your dog’s health and well-being is much more important than a trick. Let’s begin. The first thing is to teach your dog that great things will happen if it stands on its hind legs. That’s why you need to reward your dog when it moves into that position. Begin by placing your dog in a sitting position, and then place a treat above your dog’s head. Next, you move your hand upward and toward your dog’s back. The goal is to get your dog’s front legs off the ground. As soon as this happens, reward your dog immediately. Continue to reward your dog while gradually moving the treat higher and higher. 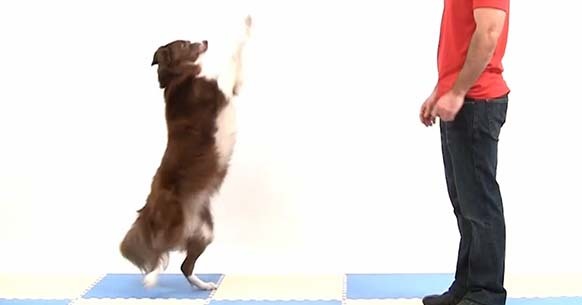 The final goal is to get your dog to stand tall on the tip of its toes, as seen in the video. Make sure that your dog doesn’t put its paws on you when doing this trick; your dog should learn to balance itself without your help. Once you can easily lure your dog into the stand tall position, the next step is to begin conditioning a hand signal. This step is to avoid having your dog become dependent on you holding a treat above its head to do the trick. You will be able to trigger this behavior from a distance, which looks much more impressive. The easiest way to do this step is by creating a pattern (e.g., 3:1), which means three lures followed by one hand signal. This works great because it sets your dog up for success. Your dog will anticipate what you want it to do, and it will stand tall even though you don’t have a treat in your hand. In the beginning, make your hand signals identical to your lure. Basically, this is the same motion as your lure but without any food inside. You can see more clearly what I mean in the video above. Next, while ensuring that your dog is successful and being rewarded for every repetition, you can slowly make changes to your hand signal. Preferably, move your hand away from your dog and use your index finger pointing up as the hand signal. The key here is to refine your hand signal to the degree of perfection you want before moving to stage three. Once you can consistently signal your dog to stand tall and you have refined your hand signal to the degree of perfection you want, you can begin conditioning a verbal command. Saying your verbal command just before you give your hand signal easily accomplishes this. However, it is important that you leave a small pause between the two so your dog learns that verbal commands are what trigger the hand signal. A common mistake new trainers make is that they say their command at the same time they give their hand signal. You really must say “Stand,” and give your hand signal after. Practice this at least twenty times, and then start testing your dog’s understanding of the command. You can test your dog’s understanding by creating a pattern in which you say your command (e.g., “Stand”) followed by a hand signal three times in a row. Then, on the fourth repetition you simply say “Stand” and see if your dog responds to your verbal command. If your dog responds, then great! Make sure that you celebrate with a treat and lots of praise. However, if your dog does not respond, this usually means you need more conditioning with hand signals. Also, you might want to record your training sessions to see if you project any subtle body language that your dog might be picking up instead of your verbal command. For example, a common mistake people make when training their dog to lie down is to say “Down” while nodding their head or looking down. Although this seems harmless, some dogs will learn to ignore the command and simply wait for the head movement. As you can imagine, this is problematic if the owner is not directly in front of the dog. I am so happy you have decided to teach your dog this trick. I think you’re going to love it, especially once you see people’s reaction to it. Although it’s extremely simple to teach, people will think your dog is a genius. NOTE: By the way, I have written an in-depth guide about the four stages of luring. Be sure to read it if you want to apply it to teaching your dog other behaviors and tricks. It’s available here. In this post, I’m going to discuss in great depth the four stages of luring, a common training technique to get your dog to do a specific behavior such as sitting, lying down, or rolling over. Luring is extremely easy and will work with any dog that is food motivated. You place a piece of food inside your hand and position it next to your dog’s nose. Because your dog will want the food, it will begin to sniff your hand. While your dog is interested in the food, you can move your hand in different positions to prompt your dog to get into a certain position. For example, you can move your hand upward and toward your dog’s ears to get it to sit or move your hand down and toward its paws to get your dog to lie down. 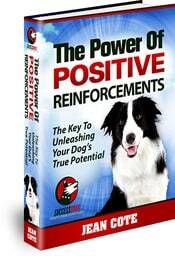 It’s a useful technique available to anyone wanting to train a dog by using positive reinforcements. However, it does have its limits. You cannot use luring to counter-condition an existing behavior such as barking or pulling on the leash. And you cannot use it to teach your dog an intricate behavior such as playing chess or retrieving a ball. Luring is the first technique I learned to train my dog with. I learned it while attending dog training classes here locally. And I will never forget the moment when I was finally able to communicate what I wanted to my dog. So that my dog learned to instantly respond to my “sit,” “down,” “stand,” and “get in” commands. 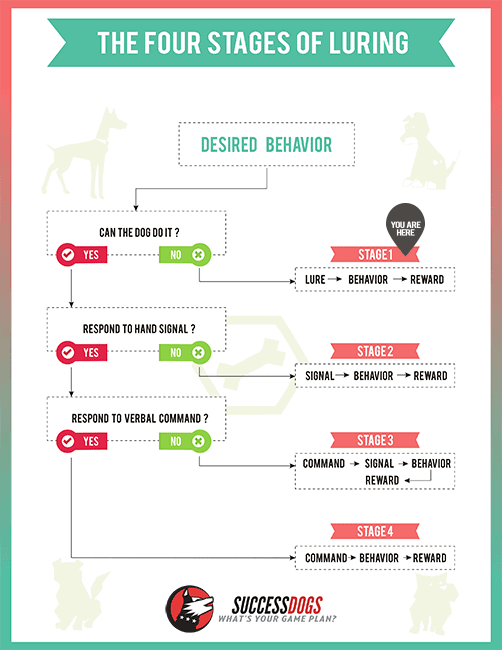 I created this diagram to help you understand more clearly luring process and how you can get to the point where your dog responds to your verbal commands. The first step, as indicated by the “YOU ARE HERE” marker in the image above, is the behavior you want your dog to do. 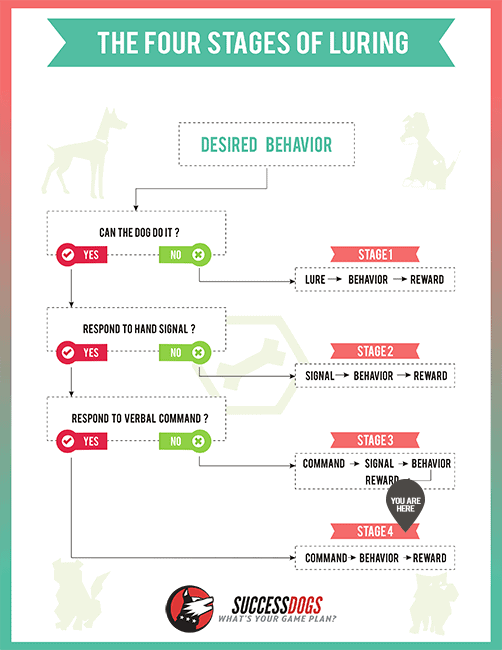 Whenever you use this diagram, you must think about one specific behavior you want to train. This is what I call the “desired behavior.” Then you go through the questions on the left, and if any of the answers is “no,” then this is the stage you need to work on. I will explain each stage in detail below. Once you’ve figured out exactly which behavior you want to work on, then you must ask yourself the first question: “Can the dog do it?” This question is in relation to your ability to lure the dog into that position. 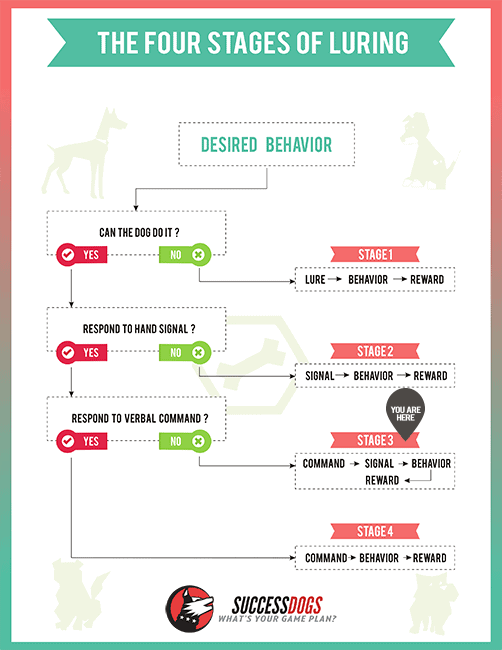 For example, if your desired behavior is getting your dog to sit, well, every dog is able to sit at some point. But can your dog do it in relation to the lure? The question really should be, “Am I able to consistently lure my dog into this position?” but it didn’t fit inside the diagram. So if the answer is “no,” then this is where you need to begin. You will need to pick a food that your dog absolutely loves, something that it only gets as a treat, like a piece of chicken or sausage. Then place this food inside the palm of your hand and close your hand like a fist. Your dog will be able to smell the treat but won’t be able to eat it. And the way this stage works is this: You move your hand while your dog is sniffing it. This is essentially what luring is. Because your dog is trying to get to the food, it will follow your hand. Your goal here is to move your hand in a way that gets your dog in a particular position. So, for example, if you wanted to get your dog to sit, you would move your hand upward and toward your dog’s ears. Now, the secret for this to work with your dog is all about when you release the treat. This is what is going to communicate to your dog: Whatever behavior you just did is what earned you this treat. So to reward the sit, you would immediately open your hand and give your dog the treat after its behind touches the ground. And when you do this over and over, your dog will quickly learn that the fastest way to get the treat is to sit down. There is also the option of giving a marker signal once your dog gets into the desired position. A marker signal can be either the word “yes” or the sound of a clicker. In this stage, a marker signal is not needed because releasing the treat once the dog gets into the desired position is enough for a dog to understand what you want. Okay, it’s time for the second stage. This is where you teach your dog to respond to a hand signal. You need to teach your dog a unique hand signal for every specific behavior. For example, sitting is an upward motion with the palm of your hand facing upward. Teaching your dog a hand signal has numerous benefits, the main one being preventing your dog from becoming dependent on you having a treat in your hand for it to do the behavior. Another reason is that you want your dog to learn your body language so you can communicate at a distance. I remember when I taught my dog Onyx to respond to all of my hand signals for the obedience behaviors. She would lie down, sit, stand, come, and sit at my side without me ever having to say anything. I thought it was the coolest thing ever. And this is why I love this stage so much: You are effectively communicating with your dog with just the use of your body. 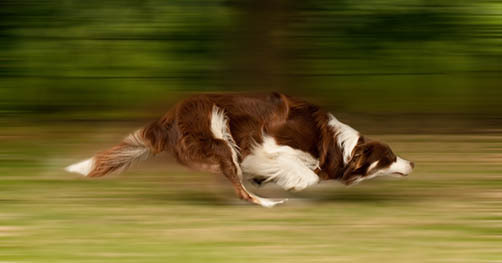 Dogs are extremely visual, and they can notice the slightest change in your physiology. To teach your dog a hand signal, you will have to do it gradually because if your dog is used to following a lure, and all of sudden you use a hand signal, your dog is not going to understand. That’s why you must first create a pattern so your dog will be successful. This is done by luring your dog three times in a row (the same way as described in stage one). Then, on the fourth repetition, take the food out of your hand and move your hand the same way as a lure. This works well because you’ve just rewarded your dog three times in a row for getting into the position. And your dog is smart; it will anticipate that you want the behavior repeated. So even though there isn’t any food in your hand, your dog is still going to do the same thing. This is what is called a 3:1 ratio; you lure your dog three times in a row, each time followed by a hand signal. Then continue practicing until you can lower the ratio to 2:1, then 1:1 and, eventually, you phase out the lures altogether. What is important to note here is that this is a gradual process; it won’t happen overnight. You need to make sure your dog is successful. If you try to give your dog a hand signal over and over, and the dog fails, you’re both going to become frustrated. That’s why you have to take it one step at a time. From my years of experience teaching hand signals, I would like to share one more key distinction with you. Whenever you give your dog a hand signal, and it responds by doing the behavior you want, you should always bring your treat to your signal hand before giving it to your dog. This will keep your dog focused and attentive to your signal hand because that is where the treats are. Once your dog consistently responds to your hand signal and is no longer dependent on the lures, you will want to move on to the next phase, which is to refine your hand signal. For example, a hand signal in the beginning might look more like a lure with the hand closed and close to the dog’s nose. But then you will want to make refinements to that hand signal and open your palm and face it in a certain direction. What you want to do is make one small change at a time. Once your dog is successful, continue refining your hand signal. You can continue doing this until you have the perfect hand signal you want. It’s totally up to you. You will also need to do the same thing with distance. Begin with a hand signal next to your dog’s nose and gradually increase the distance until you are a foot or two away. This might surprise you, but did you notice that I didn’t mention anything about a verbal command in the first two stages? 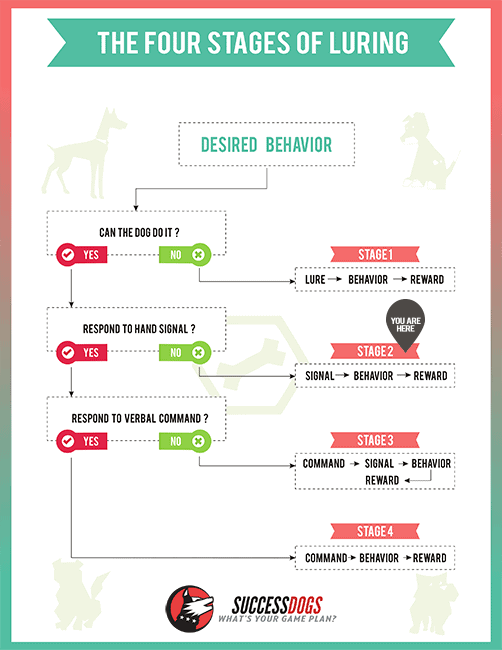 The reason is that dogs have no idea what a verbal command means until it’s been associated with a certain behavior. In fact, dogs don’t understand the commands “Sit” or “Down.” You could train your dog to sit when you say “Banana” if you wanted to. The word itself is meaningless. The way dogs learn a verbal command is through repetitions in which the dog learns to offer a specific behavior after hearing the command in order to get the reward. It’s that simple. And I have some great news. Most of the hard work is done in the first two stages in which you teach the dog the behavior and the hand signal. Once you can consistently and easily signal your dog into a position, then all you have to do is say your verbal command just before giving your hand signal. 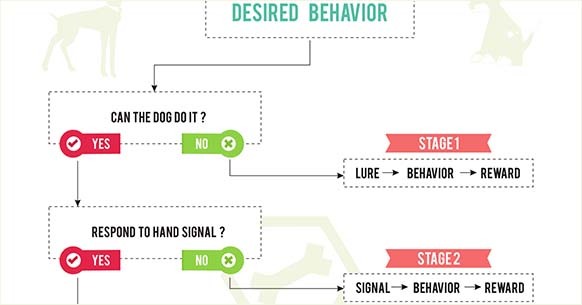 Here is an example: In stage two, you would begin by giving your dog the signal for sitting. Then your dog would sit. And then you would give it a treat. Now all you have to do is say “Sit.” Then give your hand signal and, once your dog sits, you give it a treat. Your dog will learn through repetition that every single time you give your verbal command, the same hand signal is given afterward. Eventually, your dog is going to start doing the behavior before you even have a chance to give your hand signal. There are a few important details that I would like to bring to your attention. First, make sure that you say your verbal command without using any body language. This means that, before you say your verbal command, make sure that you stand tall with your arms and hands at your side. Most dogs are primarily visual, and they will pick up on any subtle body language, so if you nod your head every time you give the command “Down,” your dog might be responding to the nod rather than the verbal command. Second, you must always say your verbal command before giving your hand signal. It won’t work if you say it at the same time, and this is a common mistake new trainers make. Third, and this is a little more advanced, but my guess is you want to master this training method, or you wouldn’t have read this far. You will want to randomize your repetitions. And what I mean by “randomize” is this: Instead of doing the same thing over and over at the exact same pace, try to increase and decrease the length of time between repetitions. For example, you could do one repetition, then move around a little bit to distract your dog, then do another repetition. This randomization will keep your dog attentive to the initial trigger, which is your verbal command. The final stage is all about phasing out your hand signal. You can continue working with the hand signal if it’s something you want to use with your dog, but my bet is you want your dog to respond solely to your verbal command. Before you can begin phasing out the hand signal, it’s important that you’ve practiced the stage three exercise enough times that your dog is starting to perform the behavior before you have a chance to give your hand signal. This is what tells you when your dog is ready. Do you remember how we created a pattern in stage two when we started with a 3:1 ratio: three lures to one hand signal? You’re going to use this same principle in this stage to phase out the hand signal. The purpose, if you recall, is to create a pattern so your dog will be successful. If your dog does something three times in a row, the dog will most likely do it a fourth time. So begin by creating a pattern with a 3:1 ratio. Practice giving your command three times in a row, followed by a hand signal, and then reward your dog for doing the behavior. But on the fourth repetition, you will want to give your verbal command without giving a hand signal. Then wait: If your dog performs the behavior, make sure you celebrate; give your dog a treat and lots of praise. Your dog has effectively responded to your verbal command. But this doesn’t always work on the first try. Sometimes you might need to give a slight hint of the hand signal, such as slightly moving your shoulder or arm. 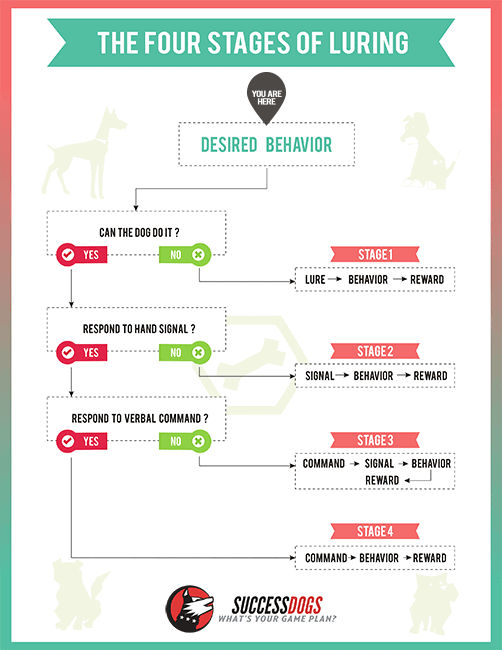 But the goal is to get your dog to respond solely to your verbal command. So be sure this doesn’t become a habit. Once you are successful with a 3:1 ratio, the only thing left is to gradually reduce this ratio to 2:1, 1:1, and eventually phase out the hand signals altogether. I understand this might seem overwhelming, especially if you’re just starting out. It’s like learning how to drive a car. If you remember, it was hard, and you had to pay attention to so many things, but now you can do it without even thinking about it. The same is true with this training method. Once you’ve gone through all four stages with your dog, you’ll say to yourself, “Ah, that was easy!” And it is, but you have to start somewhere. So choose a behavior you’d like to teach your dog—something simple such as sitting. Begin with stage one, and work your way from there. If you would like to see specific examples, such as how to lure your dog into a sit position or what my hand signal looks like, you are welcome to get my Good Dog Every Day Program that demonstrates how I work with my own dog. I look forward to hearing about your success with this training method. Last week I published three dog training tips to help you train your dog. These training tips are not meant to be full courses but rather “golden nuggets” of information. One of them was about training your dog to come, and more specifically one technique that I discussed was the “Rocket Launch”. Where you have a friend hold your dog and you call your dog and run in the opposite direction to trigger your dog’s chasing instinct. You can actually read more about the “Rocket Launch” technique by clicking here. 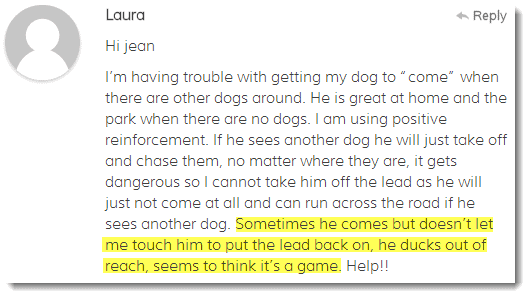 What I enjoy about publishing these dog training tips is the interaction that I get with other dog owners. I can read about their struggles and help them. And this is what happened; I received some interesting questions about a variety of subjects. One question in particular was about training a dog to come close and being able to put a lead on. So in response to Laura’s question, and anybody who might have the same issue, I’ve decided to take one of the lessons from my Walk in Harmony Game Plan and share it with you for free. This training game is called “The Collar Grab Game”. 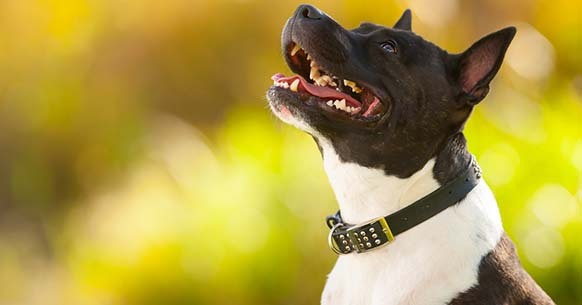 And basically you want to condition your dog that great things will happen when you grab your dog’s collar. Because here is the thing; most dogs learn over time that coming back to you (or their owner) is something to avoid because it leads to a loss of freedom. Think of it from your dog’s perspective. If your dog is playing freely in a park, and it’s finally time to go home, what do you do? You call your dog to you, put the leash on your dog and go home. But over time, your dog will learn this pattern. And you may already be experiencing some side effects of that with your dog starting to “ignore” your come command, or not fully coming all the way to you and staying a few feet away, or running away when you try to put on the leash. So to counter-act this, you simply have to play “The Collar Grab Game”. Basically you take your dog’s collar, give your dog a treat, and then release the collar. Simple right? So when can you use this? You’d want to use this when practicing recalls; get in the habit of grabbing your dog’s collar whenever your dog gets to you. Of course sometimes put the leash on, and other times release your dog. There’s times when I’m at the park and I purposefully practice this game with my dog. I would call my dog to me and then grab the collar, put the leash on, give her a treat and then let her go back to play.